Offering magnificent views over Sydney Harbour, why not try this fantastic 3.5 star apartment accommodation during your next stay in Sydney? Offering a range of hotel accommodation in Potts Point, Macleay Serviced Apartments/Hotel provides friendly and attentive service, and can assist in planning your sightseeing to Sydney Opera House, Darling Harbour, Bondi Beach, the Blue Mountains, the list is endless in Sydney. The Macleay Serviced Apartments is close to everything that Sydney has to offer and features numerous guests facilities including business centre, child minding, direct internet access, faxing facilities, guest laundry, gym & fitness equipment, lift, restaurant, room service, outdoor swimming pool, tour desk, bbq, airport shuttle, 24 hour reception, baby cots available, babysitting service, daily housekeeping and beauty salon/day spa. ** Bridge and Harbour view guests will be invited to the roof 31st December 2007 to enjoy the specatular fire works display across Sydney**126 studio apartments which are like hotel rooms with cooking facilities. Many studios have fantastic views of The Bridge & Opera House or Elizabeth Bay across the Harbour to The Heads. 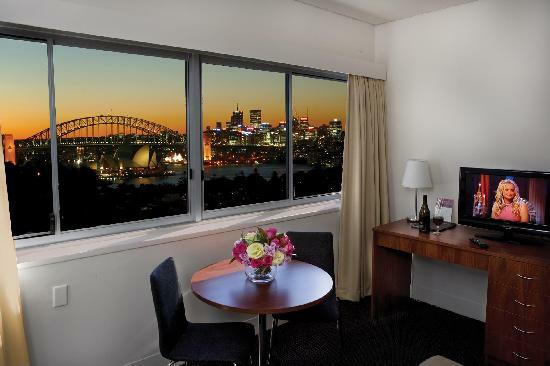 Nearby Attractions : Circular Quay, The Rocks, CBD, Darling harbour, SCG and Aussie Football Stadium. Studio Apartment - Districtview : Sleeps up to 3 guests on 1 Double Or 1 Queen Bed, Extra Bed Can Be Added. Studio Apartment - Harbourview : Sleeps up to 3 guests on 1 Double Or 1 Queen Bed, Extra Bed Can Be Added. Studio Triple Apt - Harbourview : Sleeps up to 4 guests on 1 Double And 1 Single + Rollaway Bed Extra. Studio Triple Apt - Districtview : Sleeps up to 4 guests on 1 Double And 1 Single + Rollaway Bed Extra.